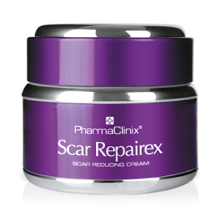 Scar Repairex is a new, scientifically formulated silicon-based cream, that contains powerful anti-oxidants, that helps improve the appearance of disconcerting scars. With all these ingredients and no explanation as to what each treats, this can give pause to a conusmer concerned with possible allergic reactions or irritations if they have sensitive skin. Prolonged use will give better results. There are no possible side effects listed on either product source. Scar Repairex does state that prolonged use will give better results. The product claims to work better on scars that are no older than 6 months old. No other information is provided. The actual size(in ounces or milliliters) is not provided. This product is available for purchase from the manufacturer or selected retailers. Scar Repairex is a little pricey considering it does not even provide how much of the product a consumer receives for the price. Scar Repairex contains no information on the product source in regards to any type of guarantee. There is a contact number (located in Great Britain) and an email address on the Contact Us page for any questions or concerns. If there was a guarantee, then why would it not be placed conveniently for the consumer to review on their own? Scar Repairex is a good product. However, it provides no information as to whether it can even be purchased in the United States or even shipped here. There is absolutely no information as to where this product can or cannot be shipped. Why should a consumer have to contact them just to see if there product can be shipped to the consumer’s country? Also, the guarantee, well lack thereof, is very disconcerting to any consumer. The ingredient we find, are alarmingly too many as well.